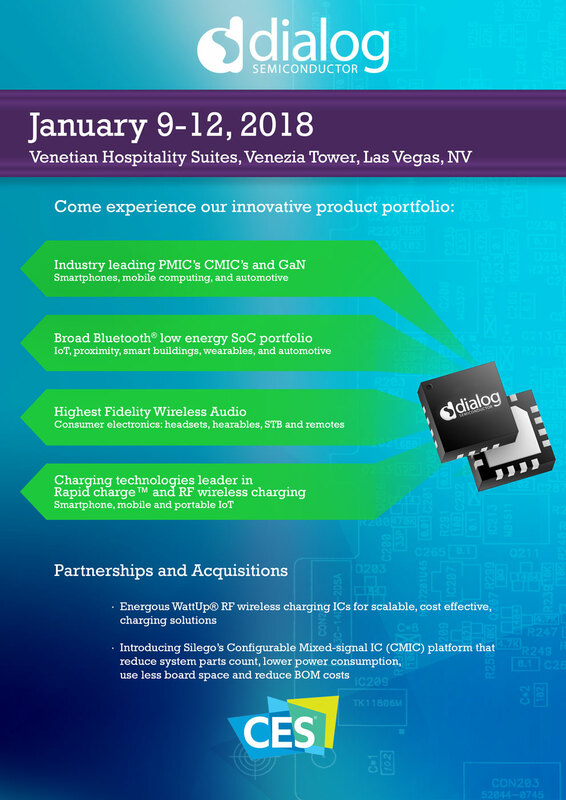 Dialog Semiconductor announces a Low Power Connectivity Roadshow! 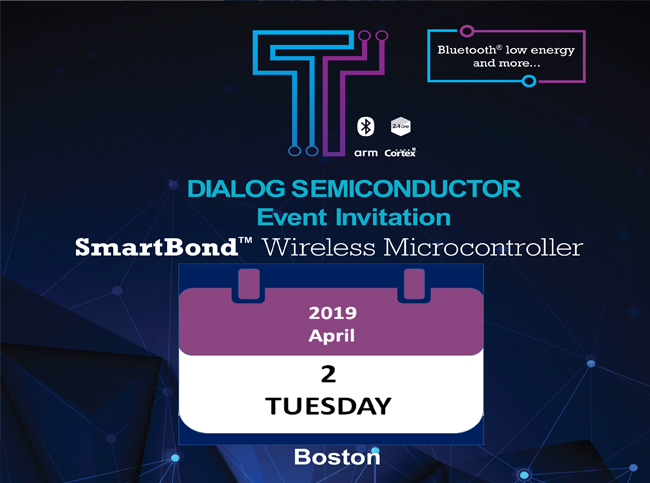 A FREE event featuring Bluetooth Low Energy from Dialog Semiconductor! In this workshop, attendees will receive two free Bluetooth low energy development kits — worth more than $160! — as well as hands-on training sessions, new technology demonstrations, and presentations from Dialog’s market applications experts. Please see invitation for workshop details. - It is important to note that the registration is free until December 18th, 2018. 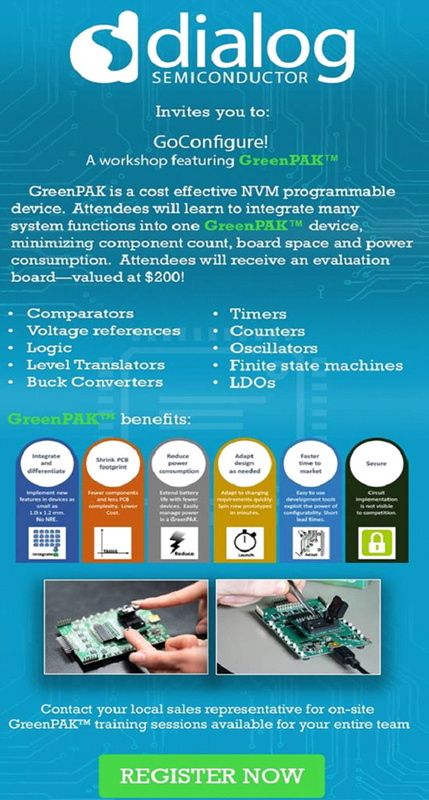 A workshop featuring GreenPAK Configurable Mixed Signal ICs from Dialog Semiconductor! In this hands-on workshop, attendees will receive an evaluation board—valued at $200!—as well as the tools to be ready to apply their new knowledge. By the end of the day, engineers will be able to successfully integrate many separate functions on a PCB into one IC which offers enhanced security and differentiation while reducing cost and improving reliability. The 2018 TDK Developers Conference registration website is now open! This year’s conference will inspire Developers/Engineers/Partners/Customers with “TDK’s Portfolio of Solutions” bringing together market leaders, executives, senior engineers, and the media, to learn about market advancements, developments, design concerns and new technology offerings across microphones, fingerprint, navigation, motion sensors, hall sensors, environmental sensors, ultrasonic sensors, piezo actuators with haptic feedback, RF components, and rechargeable solid-state SMD battery technologies. TDK, together with InvenSense and the entire family of TDK group companies, which include EPCOS, Hutchinson, Micronas, and Tronics, are inviting you to the 7th annual TDK Developers Conference, September 17 - 18, 2018, one of the largest MEMS/Sensor/Component based developer’s conferences in the world. 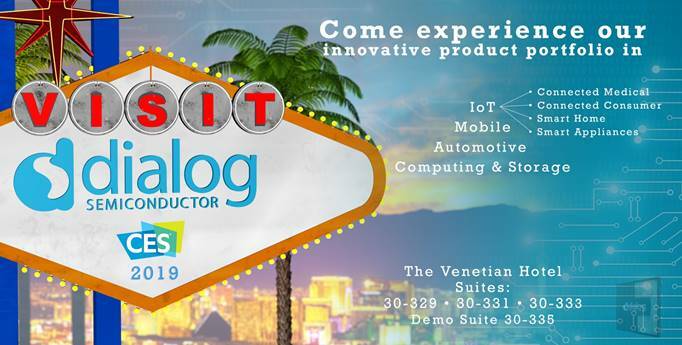 Bringing together System OEM's, H/W developers, S/W developers, Ecosystem Partners, Application Developers, Industry Analysts, Venture Capitalists, and the Media for a comprehensive, educational event covering Developer Tools, Home Connectivity/HVAC, Motion Development, AR/VR/HMD, Energy/Industrial, Haptics, Automotive solutions, ToF, Wearables/Health, Drone, IoT, Wireless Solutions, and Robotics. · Agenda: 1 ½ days packed with 5 tracks, for a total of 25 class sessions to choose, exploring key solutions and platforms: Developer Tools, HVAC, Motion Development, Haptics, Pressure, Microphone, Temperature, Health/Wellness, Battery, and Industrial/Automotive. Each Track will feature multiple sessions to choose from with expert speakers from TDK, InvenSense, Micronas, Tronics, EPCOS, Hutchinson, and more! 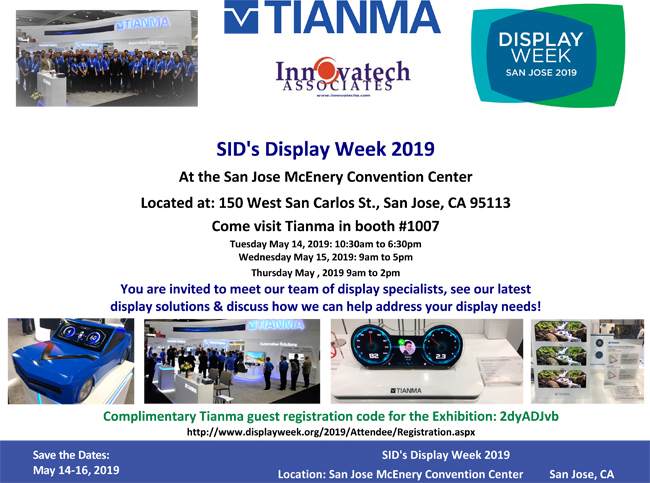 · Tradeshow: 8 hours of floor access to our showcase/exhibition hall featuring some of the newest technologies and services from the TDK family of group companies. You will also have the ability to talk to executives, engineers, product managers, and the chance to network with many other professionals from Silicon Valley and around the world! Do you have technology questions? Over 300 guests learned all about TDK at last year's developers conference, you don’t want to miss out this year! InvenSense is now part of TDK! Together with the TDK family of sensor companies, including TDK USA, TDK-Micronas, and EPCOS, we are excited to invite you to visit us at this year’s 2018 Consumer Electronics Show in Las Vegas, Nevada, January 9th – January 12th, in Tech East, LVCC South Hall 3 #30325 (Click Here for map). Our vision of a “World of Sensors” is coming to fruition and TDK’s sensor group companies are showcasing sensor technologies and platforms for mobile, wearable, automotive, IoT and industrial products. Come by and explore our great line up of motion, audio and location products, and services, that are leading the way for the future of Multi-Sensory Fusion! Pressure Sensor – Shhhh, it’s a secret, but we will be announcing a new product to enhance our pressure sensor line-up of products at CES! So, come by and find out why capacitive pressure sensors are a better solution than current pieoresistive sensor solutions currently out in the market today. Automotive Sensors – Learn all about the multiple Automotive solutions which TDK, InvenSense, Micronas, and EPCOS have available! Learn why 6-axis sensor solutions are now requirements in Electronic Stability Control (ESC), Navigation, and ultimately Autonomous Driving! Find out how Embedded Motor Control is setting a focus onto the requirements for small motors in automotive actuators. 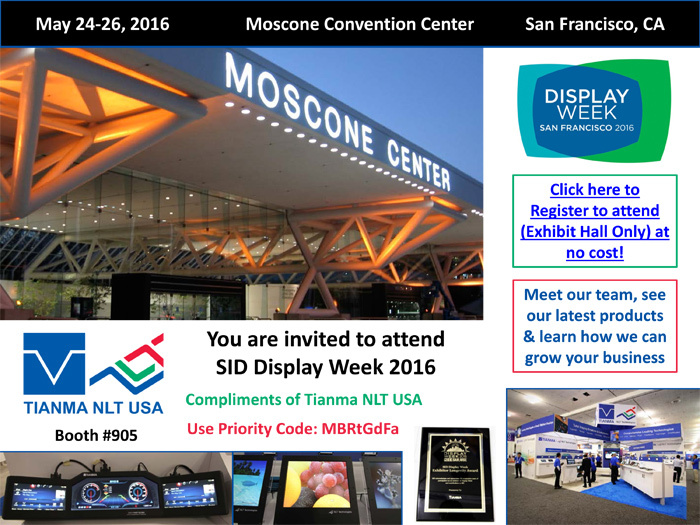 Bio-sensors – Discover multiple TDK wearable solutions! A wristband-type wearable biosensor capable of measuring and recording the amount of conversation/sleeping time/pulse/UV, and activity. A patch-type wearable biosensor measuring cardiac potential. A portable-type biosensor transmitting emergency call location information and a digital basal thermometer with communication functionality. Microphones – Hear solutions using analog or digital, single element or beamforming arrays, all covered in the TDK-InvenSense portfolio and available through our partners, showcasing our microphone performance through turnkey solutions. Development – Try out our recently released SmartMotion development platform. A new architecture apportioning our 6-axis, 7-axis and 9-axis sensors into development kits to accelerate the development of IoT solutions based on InvenSense motion sensors. HMD – Experience InvenSense’s newest solution of AR/VR head-mount displays using the Google Daydream platform! We’ll show why basic sensor fusion algorithms, especially the predictive quaternion, are essential for fast and accurate rendering of the virtual reality world. Industrial solutions – Play with TDK’s robotic arm demonstration using TMR angle sensors that are excellent in noise resistance and angular accuracy. Navigation Solutions – Come and find the next-generation of indoor and outdoor location-centric services that will be created through the use of high-precision inertial positioning. 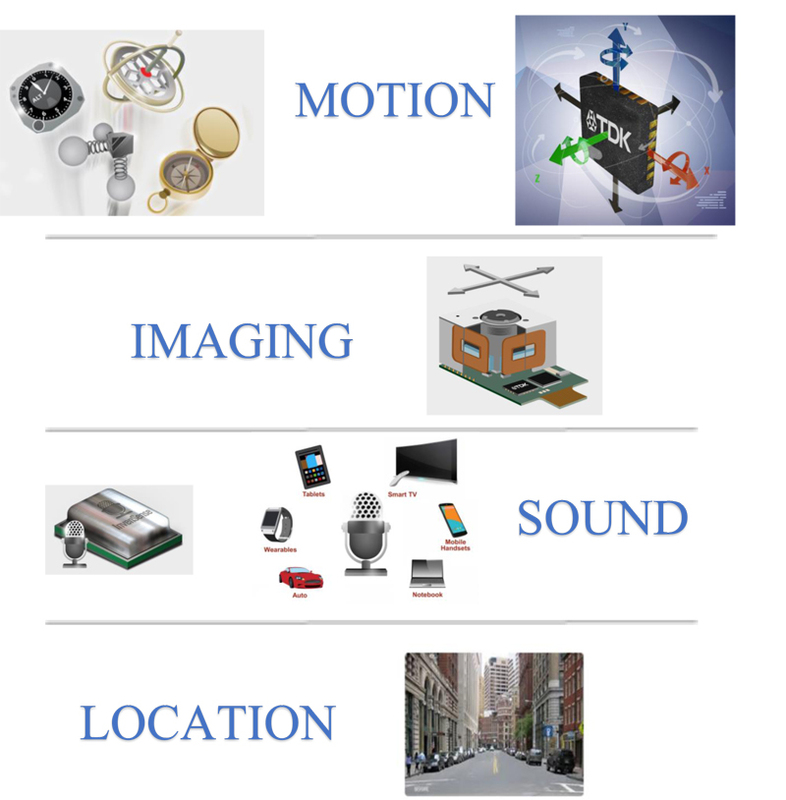 Imaging Solutions – Experience InvenSense’s Electronic Image Stabilization (EIS) solution, providing for a stable, jitter-free video experience, for mobile, drone, and automotive products. Drone Demonstration – Come and see our new 7-axis solution (3-axis accelerometer, 3-axis gyroscope, and a barometric pressure sensor) in a live drone cage demonstration! InvenSense will have senior members from the TDK and InvenSense executive teams, and product and technical management available for any inquires. 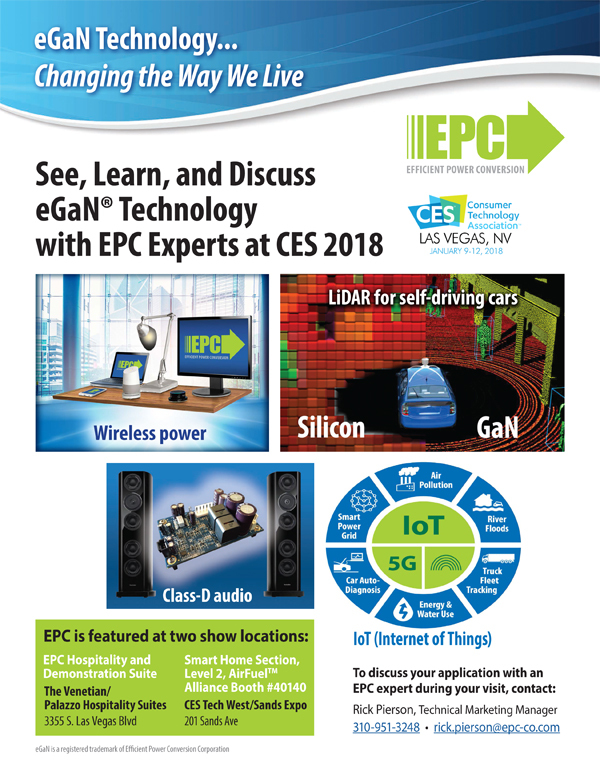 Please contact me immediately and we can schedule a meeting in one of our conference rooms and demonstrate to you our “World of Sensors” platforms at this year’s CES | 1/9-12/18 | Las Vegas, NV | South Hall 3 #30235 (Click Here for map). 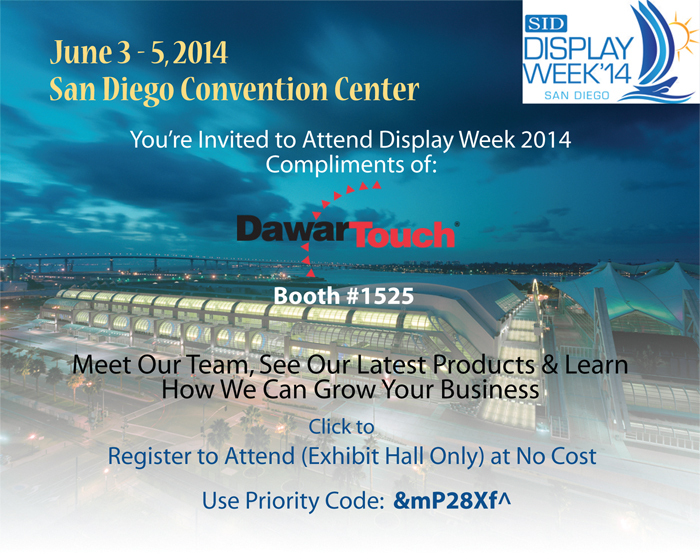 Come Visit Dawar Technologies @ SID 2014 - Booth 1525! complimentary pass to the exhibit hall. 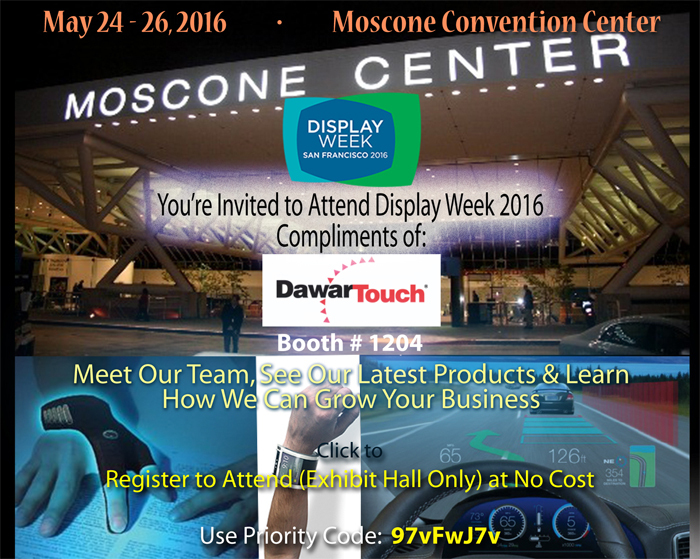 Dawar Technologies is proud to be exhibiting again this year at Display Week 2014. 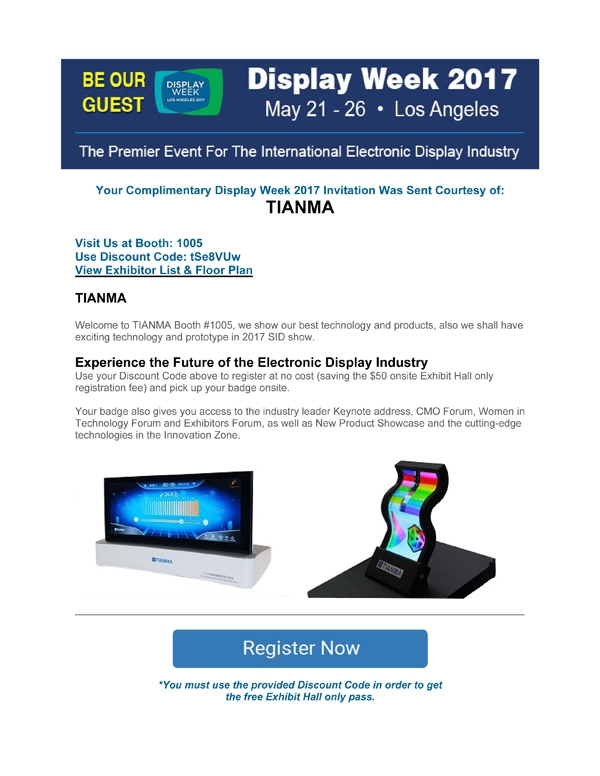 With over 135 years of experience, the leaders of HMI Solutions bring you some exciting new products available for demo at this year’s show. Thinner, lighter and more cost-effective! Dawar has recently added four new standard products to their current PCAP product portfolio. With over 40 standard SKUs currently available and full custom capabilities, Dawar is sure to have the right product available to meet your application requirements. · PCAP_15.6W-00001 - 15.6” PCAP touch screen (controller board solution). · PCAPCOF_15.6W-00001 - 15.6” PCAP touch screen with Chip on Flex (COF) controller. · PCAPCOF_07.0W-00CL1 - 7.0” PCAP touch screen with Chip on Flex (COF) controller and a 1.1mm Chemically Strengthened Glass Cover Lens with black border printing. · PCAP_10.4-00CL1 - 10.4” PCAP touch screen (controller board solution) with a 1.1mm Chemically Strengthened Glass Cover Lens with black border printing. Tianma would like to invite you to meet with us at CES in Las Vegas (January 7-10, 2014). We’ll be located in Las Vegas Hilton Suite: East Tower 2BR #1569. 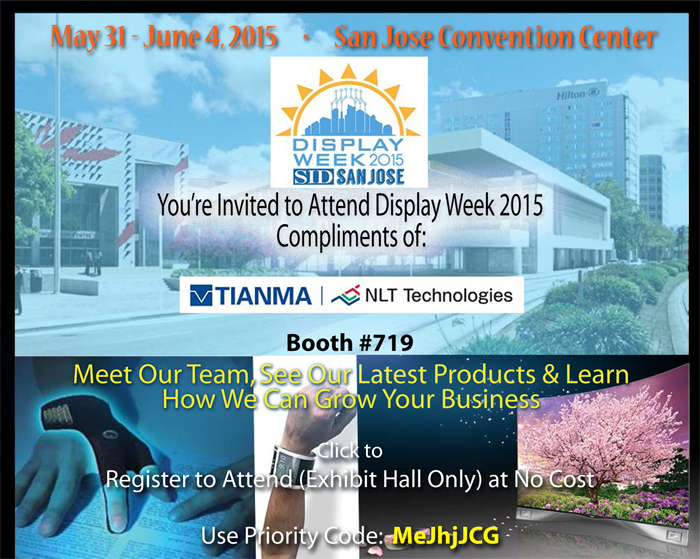 Tianma is a world leader in Passive/Monochrome as well as Active Matrix LCDs. Tianma Microelectronics now proudly celebrates two remarkable decades of its history. 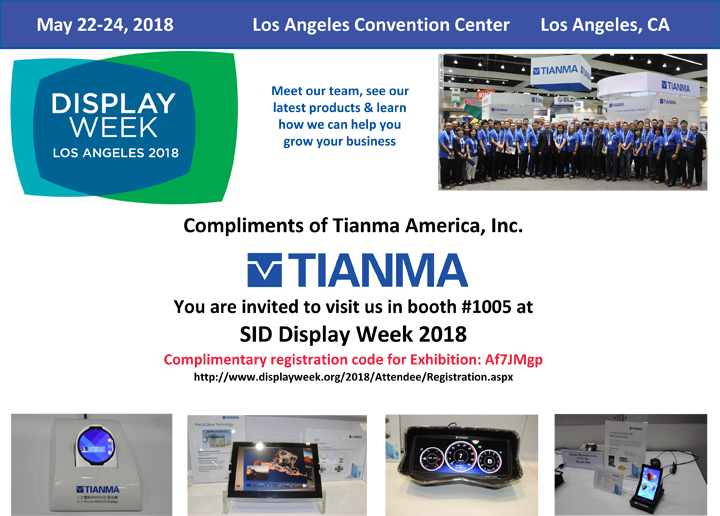 From the foundation in 1983, proactive pursuit of innovation and continuous product improvement enabled Tianma to maintain its un-rivaled position as a leading international supplier of Liquid Crystal Displays. Renown as the largest manufacturer of passive and monochrome LCD's of continental China, the company now occupies a territory of almost 1 million square feet (125K m2), of which 1.2 million ft2 is designated for the manufacturing space. Tianma's long-term success is inexorably linked to the technical expertise of staff and technological advances developed by the R&D team. The company's displays meet specific challenges of operation without compromise under the most arduous field conditions. Tianma produces displays resistant to extreme temperatures from -50 to +90 C at low voltages. It offers a wide range of conventional and special Liquid Crystal Technologies, such as: TN, HTN, ETN, BMTN, STN, FSTN, FFSTN, NFSTN, DSTN, ESTN, ECB, FSLS, LFSL, Multi-Color TN, Color STN, and TFT. For a meeting appointment please contact your Innovatech Sales Engineer or our office at Ryanc@innovatecha.com. We look forward to seeing you there! XMOS would like to invite you to meet with us at CES in Las Vegas (January 7-10, 2014). We’ll be demonstrating our latest solutions to help you deliver high quality, differentiated audio products, discussing our latest multicore microcontroller offerings, and looking ahead to our plans for 2014 and beyond. CES 2014 will be the first public demonstration of our Multi-Function Audio (MFA) Platform. Leveraging technology already in use at the heart of products from leading audiophile brands including Sony, the MFA reference platform makes it easy for you to quickly create great-sounding digital audio products. It includes a huge range of IP and connectivity options ‘out of the box’, including: USB Audio Class 2.0 functionality with audio sample rates of up to 384kHz and full 24-bit resolution; Direct Stream Digital; PC and Mac connectivity; and compatibility with current and legacy Apple products in device or host modes. XMOS also continues its leadership position in the Ethernet AVB market. 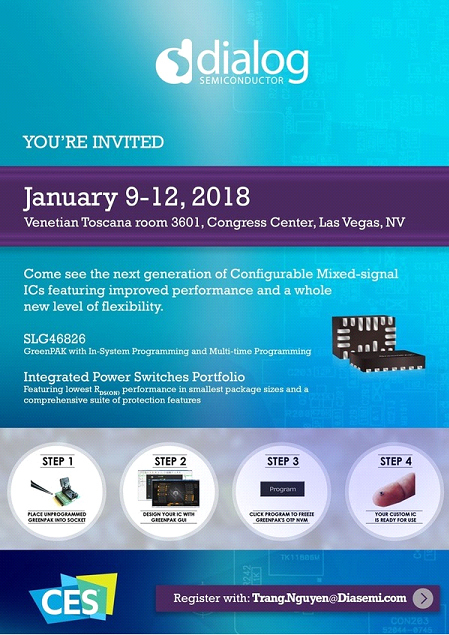 Visit us at CES for a demonstration of our AVB Daisy-Chain solution, which allows you to create products that don’t require a central switch, dramatically cutting the overall cost of AVB networking. Preview the future of Information Technology with AppliedMicro product demonstrations at Interop 2011. The rapid diversification and proliferation of ARM technology is impacting designers of a wide array of products. As technology options increase, many designers are turning to channel partners like Avnet for technical solution recommendations that are unbiased and impartial and that address performance and functionality requirements specific to a project, end application or industry segment. To address the needs of our customers, Avnet will host a global series of technical trainings, representing a unique multi-manufacturer collaboration that features an entire ecosystem of providers showcasing the latest design solutions for ARM systems.